PIOX S721 determines mass flow rate, concentration, density and other parameters by means of clamp-on ultrasonic transducers mounted on the outside of the pipe. The non-invasive acoustic technology is the system of choice when substances and processes place highest demands on safety and reliability. In a large number of binary media systems, the acoustic velocity is in a fixed proportion to concentration and density. PIOX S721 measures the acoustic velocity, thereby determining the density and concentration of the medium inside the pipe. 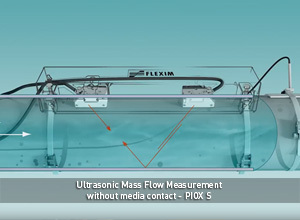 By simultaneously recording the volume flow rate, PIOX S721 automatically calculates the mass flow rate. The PIOX S measuring system, composed of a transmitter and a pair of clamp-on transducers, precisely determines the sonic velocity of the medium based upon the ultrasonic transit-time measured between the two transducers.The clamp-on transducers are mounted on the outer surface of the pipe. As they are not in contact with the medium, the system is ideally suited for the measurement of chemically aggressive, corrosive, abrasive or ultra-pure media. PIOX S can be used to determine the concentration of high purity sulfuric acid, hydrofluoric acid, nitric acid or even ammonia gas used in fertilizer plants. Worries about the transducers chemical compatibility, contamination and sealing are a thing of the past. With the clamp-on technology, retrofitting of existing installations is very easy and can be done without cutting into the pipe and without any process interruption. Transducers: IP65 to IP68, optional ATEX (IECEx) Zone 2 / FM Class I, Div. 2 Transm. : PIOX S704: IP65, ATEX (IECEx) Zone 2 opt.